The experienced hard surface restoration company shows great commitment to continue providing the best service in the industry. We are honored to receive these awards. We put effort and dedication on our work because we want to give our customers the very best. Consolidating their leadership in the hard surface restoration industry, Sir Grout New York has been honored with Home Advisor's prestigious awards. The exceptional service they provide has earned the website's recognition. This a trustworthy source that homeowners use to find reliable home improvement service providers. Consumers look for companies that have Home Advisor's seal of approval because it is a sign of high-quality service. Sir Grout New York is committed to keeping these high standards and deliver unrivaled hard surface restoration services. Their goal is to surpass all expectations and improve with each passing day. Home Advisor's distinctive badges are given to companies that demonstrate exceptional work ethics and professionalism. 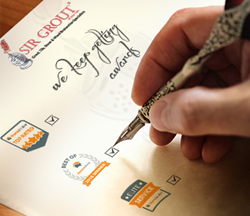 Sir Grout New York earned the Elite Service, Top-Rated Contractor, and the Best of Award Winner certification, acquiring the website's seal of approval. To validate their top-notch service, the winners must meet certain requirements. Only companies who have received a 5-star rating from at least five customers, no complaints in the last 6 months, and overall customer service rating of 4.5 or higher are eligible. Sir Grout New York has accomplished these feats thanks to their mission to provide hard surface restoration services that no other company can match. Eddie Moleros, Sir Grout New York's owner, is proud to have earned this acknowledgement. He states, "We are honored to receive these awards. We put effort and dedication on our work because we want to give our customers the very best. It is a great accomplishment to know our clients are happy and satisfied with our services. Our top priority is to bring reliable solutions to their problems." His vision for the company moving forward is reassuring: "This achievement has strengthened our commitment to be the best hard surface restoration company. For the future, we will continue improving and getting even better than we are today. We are encouraged to continue providing the top of the line service our loyal customers deserve." The positive testimonials they receive every day are proof of their customers' trust and loyalty. Joe K, a Sir Grout New York client, certifies the company's top-level service, saying in his Home Advisor review: "The technicians were very professional and courteous. They took precautions in putting down protective covering on the wood floors and removing area rugs and other items. They explained everything they were doing and how it matched the work order prepared by Eddie. I was very pleased with the outcome and could not have asked for a better outcome. The floor grout and travertine tiles looked brand new at the end of the process. The tub caulking and grout repair was unbelievably done to perfection." Sir Grout New York has won many awards throughout the years, such as the distinctive Angie's List Super Service Award, all thanks to their impeccable performance, dedication, and expertise. Their skillful technicians, tested methods, and top tier products always deliver successful outcomes to their customer's troubles. They are professional and experienced workers with a wide range of restoration processes at your disposal. From grout cleaning and sealing to stone honing and polishing in commercial or residential settings, all your hard surface restoration needs are covered. Their website http://www.sirgroutny.com and phone number (718) 514-6016 are available to schedule free evaluations with their hard surface restoration specialists.